Bright sunny weather is surprisingly flexible when photographing wildlife, as the Dalmatian Pelicans of Greece’s Lake Kerkini helped me demonstrate back in January, when I found myself on a return trip to photograph the hugely photogenic bird for the second year running. Once again the anticipation of snow was high but, just like the year before, not a single flake fell from the sky. Thankfully, with the pelicans being such good subjects and the setting so beautiful, spending a few days on the lake was far from a chore. All photo’s captured with my Nikon D810 and 400mm FL. I had in tow a group of eager photographers who made up the NaturesLens workshop I was leading and, as is usually the case with such participants, they were a lovely bunch. With the number one priority for me being to make sure they were getting their fill of shots, I found myself more excited for them when all the elements fell into place for a great photo opportunity but that’s not to say I didn’t grab a few photos whenever the chance allowed. What I really wanted to do this year was try and capture an image or two that would be a little different in look and compliment my portfolio from the previous year’s visit. Then, I went for some high-key images as well as making the most of a very dull and cloudy day with some off camera flash. This year the evenings still offered chance for high-key images and getting low to the surface, which always helps with birds on the water, to produce the more traditional style of image you associate with the lake. And alongside that, the familiar opportunities to capture the pelicans land or take flight alongside the boat, just as the very first rays of warm light pop up over the horizon, presented themselves in abundance. When the sun has barely appeared on the horizon and the light is warm but weak, it’s a lovely moment to witness and capture, even if it’s been photographed before by countless others. Never underestimate the importance of ‘being there’ for yourself! Images like this are always going to be crowd pleasers but one of the plans in my head was for some slow shutter photos and further to that, if you’re familiar with my work in anyway, you’ll know that I often favour quite dramatic, moody low-key style images. Achieving both of those things would prove tricky due to the sunny weather conditions we faced. However, by picking my moments and using the bright, high, sun and our boats position to my advantage, on one session I was able to create some nice contrasty portraits to add some variety to my Dalmatian Pelican portfolio, even if slow shutter images were all but confined to the briefest of opportunities. To achieve the look I wanted, I intentionally underexposed the images I took one morning quite dramatically, knowing I would then bring the highlights back out in processing. With the warm first rays of sun long gone, I was now shooting with a sun that was becoming forever higher and harsher in the sky. Without a cloud to be seen, producing dark moody frames would appear the last thing possible but the underexposure helped give a very punchy and contrasty look, compared to if I had just exposed the frame for what the camera would have perceived to be the right exposure, then crushed the blacks and added contrast afterwards. As always, getting as close to the end result in camera is recommended as it keeps you thinking about exposure values and how to set the camera for a desired look. It also helps in situations like this because I was shooting with an exposure that would compliment the way I needed to edit afterwards, and that’s always a better option that shooting first and trying to figure out how to edit an image later in the hope you’ll stumble on a look that suits. Thinking about the full creative process from the start like this should be first and foremost, and as an added bonus, it cuts down your editing time because you already have an idea in your head what your end result will be. For the portraits, I was able to use the boat shadow help emphasis where the light fell on one particular image. It certainly wasn’t simple, and with the boat bobbing and the pelican moving, there was an element of luck involved with the birds face falling in the light. But it paid off and helped add a little extra something to the final photos. With the in-flight images, I had to try and shoot the birds against the distant, shade covered parts of the hillsides that run along one side of the lake. Again not the easiest, as the window of shade was small so capturing the birds flying through it, with the narrow field of view offered by the 400mm, whilst the boat was moving, certainly resulted in a lot of failed attempts. Persistence is vital! But I love the way the light falls across the birds in these shots, especially the in-flight images where the light just rolls over the wings. Images like this may not appeal to everyone, of that there is no doubt. Traditional evenly exposed shots are often the images that the majority of an audience can connect with, but I always find it important to photograph subjects the way I want and playing with the light like this is something I always enjoy doing, when the opportunity is there. It challenges me to think more before I press the shutter release and to try and come away with something that isn’t going to be obvious from a first glance at the scene. Looking for ways in which you can work with light and shade are vital. It doesn’t always pay off but when it does, you’re in for a real photographic treat! 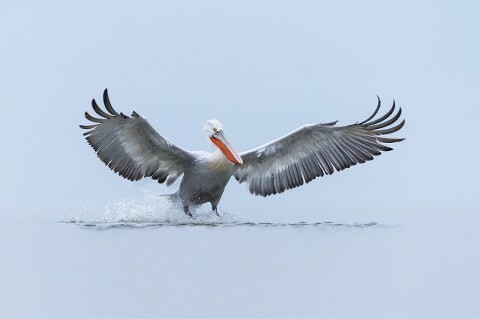 If you’d like to purchase a fine art print of one of my Dalmatian Pelican photos, you can find out more information and do so here. If you’d like to join me on a wildlife photography workshop, you can find details and availability here.